After cross-country day at Burghley, where the heavy rain made for tough going in the afternoon, Christopher Burton and Nobilis still sit in the lead. 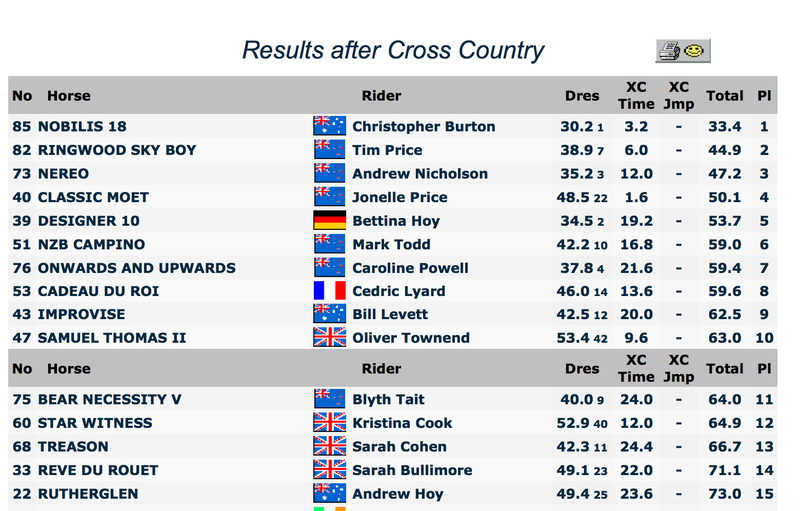 They are followed by Tim Price and Ringwood Sky Boy in second and Andrew Nicholson and Nereo in third. There were just 28 clear rounds and 40 completions from 68 starters today – and none finished inside the 11min11sec optimum time. The fastest time came from Jonelle Price and Classic Moet who were just four seconds over. The course was very interesting because all of the options that were available to riders. Captain Mark Phillips designed it so that there were longer, safer routes for many of the fences; even after a rider jumped the first part of a combination, there was often an alternative way round. Many riders took advantage of those options, even on the fly. I’m still working my way through the on-demand version of the coverage and once again thanking Burghley.Tv for making it all available.